Although the majority of UK households rely on gas condensing combi boilers for both heating and hot water, these solutions are not suitable for all homes. In particular, properties that are not connected to the gas grid will need to find an alternative solution. It’s estimated that around four million homes across the UK are not on the grid, and for these properties, oil boilers are the most common alternative. Oil fired central heating is thought to be in use in approximately two million home across the country. Providing central heating and hot water, oil fired boilers work in a similar way to gas boilers - but as their name suggests, they rely on oil as the fuel supply. This is stored on site in an external storage tank. Oil is a highly efficient fuel, meaning it gives a good return on every unit of energy used. Also, just like with gas boilers, oil central heating boilers are now available with condensing technology, which is designed to capture and re-use the heat in the flue gasses. This helps to make them much more efficient than traditional non-condensing designs. As a result, they can help you to save money on your energy bills and they are more environmentally friendly. Our modern oil condensing boilers are efficient and economical. In fact, they have an unbeaten high efficiency of 98 per cent relative to the gross calorific value. At Viessmann, we pride ourselves on designing and manufacturing futureproof and efficient oil central heating solutions for all requirements. Our comprehensive range of oil fired central heating boilers successfully overcomes the most diverse challenges facing this area of heating technology by offering innovative solutions. They are used in a wide range of applications, from historical listed buildings and highly productive industrial complexes to the large scale residential and commercial arena. Our oil boilers are built to last and boast a range of cutting-edge features. For example, they benefit from a highly robust Inox-Crossal heat exchanger made from stainless steel that provides the ideal conditions for utilising condensing technology. 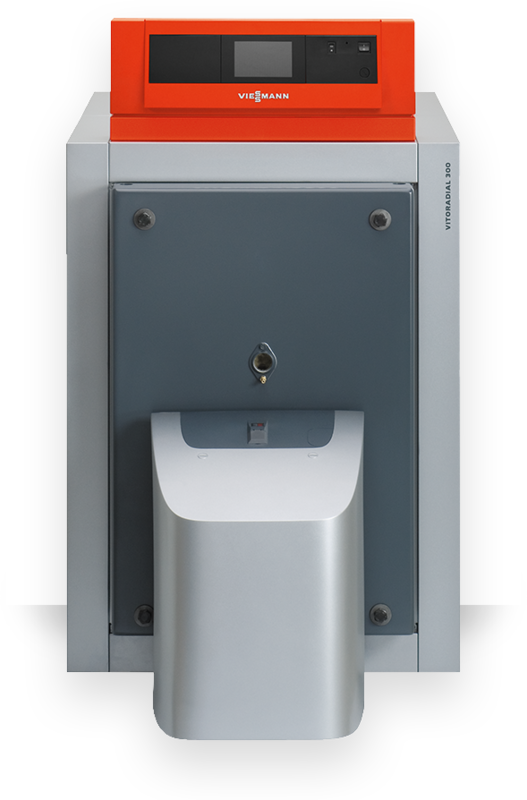 Our Vitocrossal 300 oil boiler comes with a factory-fitted MatriX radiant burner or is prepared for fitting ELCO or Weishaupt pressure-jet gas. The convenient and easy to use Vitotronic control unit also ensures quick and straightforward commissioning, maintenance and operation. The stainless steel Inox-Radial heat exchangers fitted in our boilers extract almost all of the heat present in the flue gases, converting it into additional heating energy for you to use. This increases the efficiency of your heating system, bringing your bills down and reducing the impact on the environment. Our oil boilers are designed to be compatible with solar technology for domestic hot water heating or central heating backup. This means you can tap into the free energy provided by the sun and combine this with a reliable and efficient oil boiler. In bivalent operation, the solar system heats domestic hot water and can almost completely replace the heating during the transitional period in spring and autumn. This combination permanently reduces heating costs and also lowers the burden on the environment. In addition, solar technology gives you a certain degree of independence from your fuel supplier. 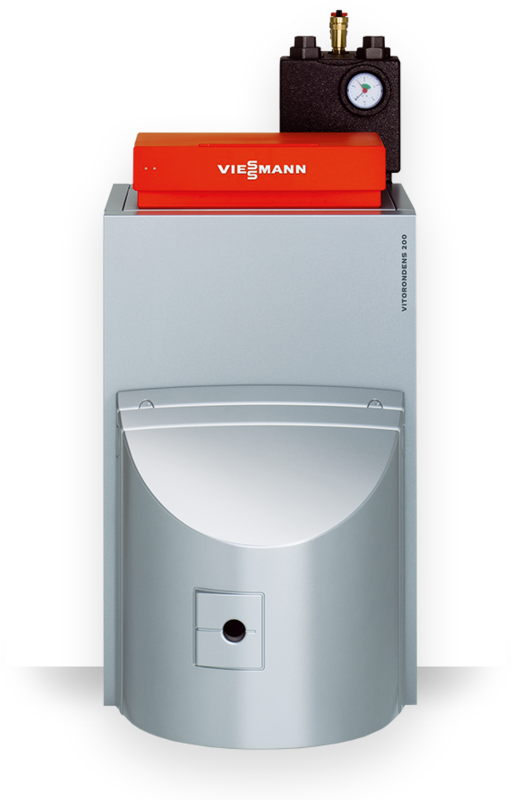 With an oil heating system from Viessmann, you will continue to be at the cutting edge of technology. These oil boilers are already prepared for a change from exclusively fossil oil to heating oil with a proportion of bio oil, and can therefore also be operated with regenerative energy sources. In this way, you actively contribute to environmental protection and also keep heating costs low. In turn, this can help you to make a long-term final switch to regenerative fuels, such as the use of environmental heat with a heat pump or biomass with a solid fuel boiler, step by step. For maximum convenience for contractors and users, the Vitotronic control unit is designed to be easy to use. The structure of its menu is clear and logical, and the unit is backlit and rich in contrast, making it simple to read. If you are ever in doubt while using it, a help function will inform you of what to do next. In addition, the graphic user interface can display heating curves and solar yield. Our oil boiler heating systems are designed and built to last. For example, the corrosion resistant Inox-Radial heat exchanger is extremely robust and it comes with a 10 year guarantee against corrosion. Want to know more about oil boilers and their suitability for your home? Check out our FAQs page. 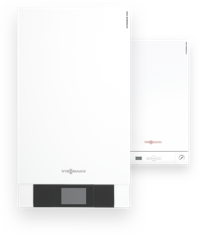 The Vitorondens 200-T boiler is delivered as a block, whilst the thermal insulation, downstream heat exchanger and control unit are fitted on site, making it ideal for modernisation projects.